There’s a mobility in perception about Broken Arrow artist JD McPherson that evades explanation. And ultimately, I guess, there’s no real harm in taking the sock hop version of McPherson at face value if that’s all you’re looking for. But there’s more to him than that. Whatever it is, it’s why he and his band have jumped from opening for neo-country star Eric Church in April to a string of late-May dates with Robert Plant. It’s a timelessness coupled with experimentation that’s captured the ears of NPR, David Letterman, The Wall Street Journal and Rolling Stone. It’s taken McPherson from an invitation to play with Queens of the Stone Age last fall to a headlining slot at Guthrie’s Queen of the Prairie Festival. McPherson’s debut album “Signs and Signifiers” was released first in 2010 on bandmate Jimmy Sutton’s Hi-Style Records (Sutton also produced) and then widely redistributed by Rounder Records in 2012. It is a surefire good-time album, heavily rooted in ’50s R&B but with glimmers of experimentation, in inspiration, in instrumentation and in a tight lyricism — with meaning — that’s easy to overlook if you’re just trying to have a good time. Notably, the new album features production from Mark Neill (The Black Keys, Old 97’s) and includes McPherson’s longtime touring band (bassist Sutton, drummer Jason Smay, pianist Ray Jacildo and saxophonist/guitarist Doug Corcoran) performing the instrumentation. That trust didn’t materialize easily, as McPherson notes he was hesitant to bring his new batch of songs to the table. Why, with McPherson apparently at the top of his game and surrounded by his own band, would recording these songs be any harder than the last go-round? “That’s a controversial question, but let’s just say I had some very personal things to say, and I needed to do it in a sort of ‘plant my flag in the ground’ way,” McPherson said. The album benefits from the ebb and flow of rock beats with moments of anticipation … weariness and energy, everything in its right place. “Let the Good Times Roll” is still in some ways a feel-good record — “It Shook Me Up” and the title track in particular — but it is, as McPherson said, vastly different from its predecessor in so many ways, and ironically titled, to boot. Despite the hard knocks during the production of “Let the Good Times Roll,” it’s a bold step forward, a statement album not just for McPherson in the studio but in the broader terms of what JD McPherson is or, more easily identifiably, what he is not. Yet I don’t actually detect any fear of artistic misunderstanding from McPherson, whose interviews in recent months have contained everything from being laid off from his teaching job to tales of songwriting inspiration drawn from “Frasier” episodes to him admitting he likes listening to his own album. Perhaps all of that contributes to the indefinable-ness of JD McPherson, in a way — the not knowing what the mystery is, or not quite being able to tell if there is one. It’s a rock ’n’ roller who loses his cool in front of his idols. It’s not expecting to hear the hard truth from a nice guy. It’s the complex reality of letting the good times roll. The dedication in the liner notes of Tulsa songwriter John Moreland’s new album is a fitting introduction. “High on Tulsa Heat” was mostly recorded on a whim in a few days in July 2014 at Moreland’s parents’ Bixby home, while they were on vacation. Produced by Moreland, with engineering and instrumental assistance from fellow Tulsans John Calvin Abney and Jared Tyler, the record is filled with pop rock, Petty-esque gems cut with plaintive ballads, ruminations on being lovesick, loneliness and, above all, the idea of home. But the very idea of home is tricky when, by choice and by trade, Moreland — whose knuckle tattoos read “OKLA” and “HOMA” — has spent much of the past several years on the road, making travel as much his home as anywhere else. Upon the release of “High on Tulsa Heat” Tuesday, Moreland will once again pack up for sometimes-greener pastures, with tour dates booked nationwide through the summer. And when he does, crowds can expect the same gravity, the same pin-drop silence that has marked many of Moreland’s recent performances. Moreland isn’t a traditional front man and doesn’t seem terribly interested in putting on a show. Instead, he’s a heartbreaker of a different color, possessed of the gift of articulation — whittling the weight of despair, lost love or homesickness into a few choice words. The resulting sadness is pointed, palpable — and the assumption is often that all the sadness is his, and that the sadness is all he is. With lines like “I guess I got a taste for poison / I’ve given up on ever being well” from “Tulsa Heat” track “Cherokee,” it’s easy to see why his songs, as Moreland would say, bum people out. But, as he’ll tell you himself, he’s not really that sad. His friends know this about him, and many of their additions to the record — namely Abney’s late-night synthesizer riffs on “High on Tulsa Heat,” and Kierston White’s whiskey-laden background vocals on “Heart’s Too Heavy” — lift the record’s spirits in unexpected ways. In tandem with this misapprehension about him being a bummer, Moreland agrees that in “real life,” he’s generally a private person. He also recognizes that this makes his career, his art, seem a bit counterintuitive. He’s made a lifelong commitment to the outlet, though, with his earlier Tulsa bands rooted in hard-core and punk rock because of the same lyrical honesty. Moreland said, when I interviewed him in 2009 with his Black Gold Band, that he got into punk rock because of the “straight-ahead, good songs with no gimmicks,” where the words mean something. Despite his earlier stabs at this style of song, it wasn’t until 2011’s “Earthbound Blues” that he feels he hit his stride. What lies ahead is the release of “High on Tulsa Heat,” where Moreland for the first time finds himself with a marketing team (Nashville’s acclaimed Thirty Tigers) and a booking agent, the latter a luxury he’s only enjoyed for a few weeks. In that same 2009 interview, Moreland discussed the difficulty of booking after crossing over from punk rock into Americana — that, at first, people weren’t ready to buy in, forcing him to work all the harder to find his market with later records. Having a team behind him, despite his success so far, is relatively new to Moreland, and while he’s learning to hand control over to people who are working in his interests, he hasn’t lost sight of the work he’s put in so far. Moreland wasn’t waiting for a break, but it appears that break may have finally come anyway, and the road ahead looks promising. And in the near future, he’ll be on that road constantly, likely earning plenty of fodder for future songs. But after all the exploration, the heartache, the leaving and returning, Moreland seems poised to forever hang his hat in Tulsa. As I walk into the coffee shop where John Fullbright and I have agreed to meet, I feel an intent stare coming from the minivan next to me. He beat me here, and when I look over to source the gaze, he breaks into a smile and waves hello. For those of you in the back, Fullbright is something of an Okie wunderkind, a songwriter who, for some of us, seemed to leap overnight from membership in the Turnpike Troubadours and solo gigs at Libby’s Cafe in Goldsby to international recognition and, eventually, a much-talked-about Grammy nomination for 2012’s “From the Ground Up,” his first studio album. Those accolades aren’t the source of my nerves, though. 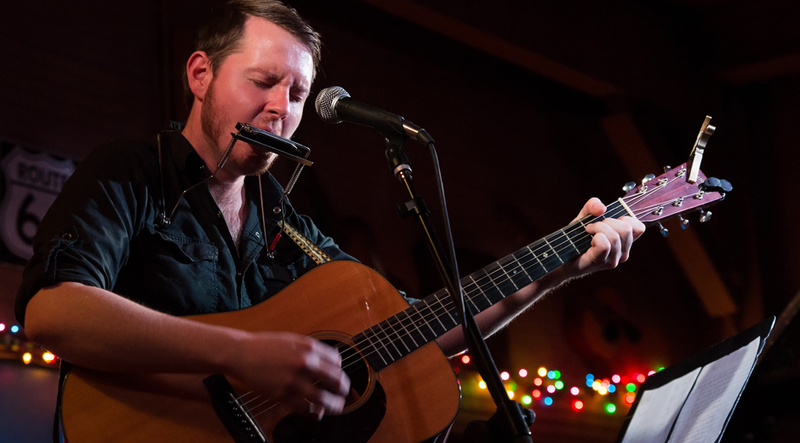 Fullbright has a bit of a reputation, particularly locally, for being reluctant to talk — not about his music, but about himself. While I’ve seen his professionalism in full effect in all sorts of places, including the Folk Alliance International Conference, South By Southwest and his own shows at the Blue Door, this is the first time I’ve put the spotlight on him. Often, when talking to Oklahoma musicians, I tread the line between interested friend and biographer, reading articles from around the world written about people I know and asking questions I may already know the answers to. I am nervous, and I tell him as much. I inquire whether or not this reluctance is in the forefront of his mind when talking to media folks like me or, more often, of a higher ilk. And for those who prod further, past the songs, past the facts, past what he wants to give? This is a conundrum for Fullbright, whose songs — including those on his upcoming album “Songs” — are clear enough and seemingly personal enough to be subjected to an autobiographical reading. I wonder aloud about the struggle to play close to the chest when your art and profession demand otherwise. Fullbright puts forth that songs, “when they’re well-written, are about the listener,” but notes the obvious problem with that. If anything, he’s victim of the aforementioned local papers pigeonholing him with a swath of “Aw, shucks!” folk cliches: Yes, he’s from the same coupling of small towns that produced Woody Guthrie, and yes, he still lives there. Yes, he has an acoustic guitar, though for those who’ve seen him live, it’s inarguable that his piano playing is more impressive. One SXSW reviewer even called him milquetoast. There’s a palpable absence of a cultivated image in Fullbright — and he is of course aware of this and of the limited perception that keeps that projected version of him alive. “If there’s a preconceived notion that I have to be some kind of Woody-head, then they’ll keep that about as long as it takes for them to come see a show and see that that is not the case,” Fullbright says. The dark, racy video for his 2013 single “Gawd Above,” featuring Fullbright singing solo in a peep show confessional booth, may have been an answer to that as well. “I just wanna be known for writing a clear, concise song,” Fullbright says. He goes on to say that experience is teaching him to whittle his songs down precisely to nothing more and nothing less than they should be. And it does, I think. “Songs” is powerful in its simplicity, and it’s (theoretically) difficult to interpret his intent. But don’t get too attached. Apologies for using another folk cliche here, but he is an old soul. It’s difficult to remember he’s only in his mid-20s, only on his second studio record. There isn’t really a correct way to interpret Wye Oak. The Baltimore rock band, comprised of singer/guitarist Jenn Wasner and drummer/keyboard player Andy Stack, doesn’t mean to give the wrong impression, but there’s no reconciling the sonic inconsistencies between its albums, nor the divergence between the sound of the record and the setup of the live show. It’s also nearly impossible to believe that Wasner, who in person is disarmingly friendly and animated, owns the heartbreaking voice behind the majority of Wye Oak’s catalog ” a depressing array of songs that touch on everything from family turmoil and religious doubt to the trials of a failing relationship. “The Knot,” released on Merge Records last year, is heavy-handed compared to the band’s latest EP, “My Neighbor / My Creator.” The former relies a great deal on distortion; the vocals are quiet and the drums loud, for the most part. The latter is comparatively triumphant and clear, although tackling many of the same issues. Perhaps most interesting about Wye Oak is that the heavy layering and complex tempos are handled onstage by the same two people who recorded layer after layer in studio. “We always think, ‘Oh, God, how are we going to do this?’ But we don’t ever let that stop us from doing some-thing on a recording” Wasner said. “We definitely have moments where we think, ‘This is the way we want it, and it’s going to be difficult to duplicate this.’ It was tough for me to get over that, but I realize now that it’s OK if the songs are different live. Among Wye Oak’s other defining characteristics are its deep ties to Baltimore. Stack and Wasner are natives who moved away for college, returned home and, shortly thereafter, formed the group. Wasner attributed the biblical reference to another source: the recently deceased Mark Linkous of alternative rock band Sparklehorse, whose “Hundreds of Sparrows” is a favorite of Wasner’s. And rightfully so. The gravity of Wye Oak’s music makes it easy to forget that Stack and Wasner are young, both in their 20s ” and semipublicly dealing with the very same issues that plague everyone else their age. Case in point: A couple linked since the act’s 2006 inception, Stack and Wasner recently parted ways, romantically, while their friendship and working relationship has remained intact. Currently on tour with Texas act Shearwater, Wye Oak performs Friday at the Opolis in Norman, and recently completed a stint at Austin’s South by Southwest festival. With Wye Oak, it’s always at least one or the other, and most of the time, it’s both. Alex Greenwald loves a good metaphor. And a bad one. Indeed, Phantom Planet’s new album, Raise the Dead, is conceptual, an exploration of the metaphorical cult of band fandom. Single “Leader” portrays a cult experience (“He explained so easily/We are all the missing pieces/Maybe you’ll fit right in, too”), with Greenwald first joining and then recruiting to the Phantom Planet family. Creepy, yes, but in reality Raise the Dead finds Greenwald (guitar/vox), Darren Robinson (guitar), Sam Farrar (bass) and Jeff Conrad (drums) settling into a medium, melding their early surf-pop with the garage rock of Phantom Planet’s eponymous third record — an album that, at its release, left diehards and neophytes alike scratching their heads. Despite the shift, Greenwald speculates about the loyalty of the Phantom Planet…ahem…cult. This forging of relationships is of greater importance lately, as the band finds itself in a number of unlikely pairings, supporting Panic at the Disco, The Rocket Summer and Paramore this year alone. Greenwald has — you guessed it — a couple of metaphors to explain. That elation is a long time coming, as Phantom Planet rounds out its 14 th year. Overcoming an unfavorable Hollywood stigma — Greenwald is a former Gap model and actor (see: Donnie Darko) and actor Jason Schwartzman is the original drummer — and leaving Epic Records in favor of the much-smaller Fueled By Ramen, Phantom Planet has abandoned anonymity for success. Greenwald analogized (of course) the band’s turbulent climb out of the L.A. pop scene. Phantom Planet has few regrets, even concerning the elephant in the room. “California” from 2002’s The Guest found smash success as the theme to Fox’s The O.C. and led countless drunks to shout the request at every performance.